Headlies: Brian Kendrick Wants To Show You A Body He Found In The Woods - WrestleCrap - The Very Worst of Pro Wrestling! 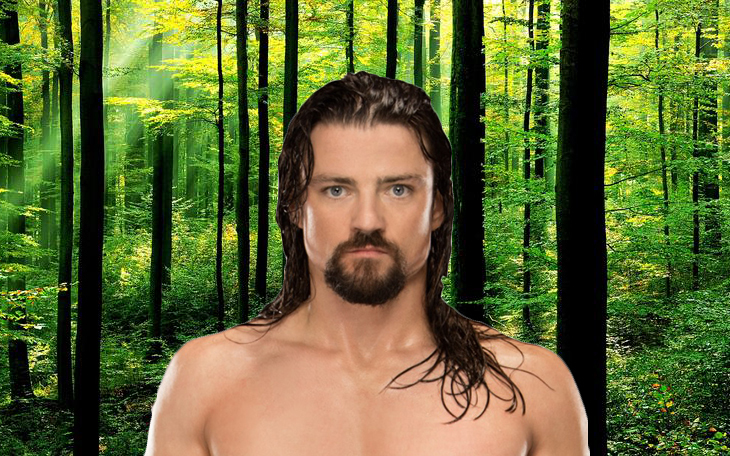 Mill Valley, CA – WWE Superstar Brian Kendrick wants to show you something cool that he found in the woods. You both skip Chemistry class and head out into the woods behind the baseball field. “Dude, it’s going to blow your mind!” says Kendrick as you walk deeper and deeper in the woods. Kendrick has always been a little different, but you trust him anyway. Sure he has wild hair, a crazy look in his eyes, and smells like stale Chili Cheese Fritos and pickle juice, but he’s just so darn entertaining. You ignore your head and go with your gut, pushing on through the thick brush, over the creek, and past the old maple syrup shack. “Brian, hold up!” you beg as you try to catch your breath. You stop and try to process all that Kendrick has said when he tells you that you’ve reached your destination. “Man, it’s right there,” whispered Kendrick. You strain your eyes and see a large pile a few hundred feet away. You and Brian inch quietly closer to the body, sticks in hand. Your heart pounds in your chest as sweat pours down your back. Suddenly, the pile moves and you both jump back. You hold the stick like a baseball bat, ready to swing at the amorphous pile. Your fear melts away as you recognize that the pile has long bleach blond hair and is wearing a long sequenced Confederate flag robe. You and Kendrick then spend the rest of the afternoon getting a badly hungover Michael Hayes a ride to his hotel. 2 Responses to "Headlies: Brian Kendrick Wants To Show You A Body He Found In The Woods"
Somehow, this entry takes me back to my childhood and Choose Your Own Adventure. As you two wander down the trail with Hayes in tow, you come upon a trailer park and sitting on the stoop at the nearest one is jamie noble. He looks at the both of you and then at Hayes and says: “Man, where did you pick up that ole pile of bones.” it’s then that you realize that for whatever reason, Hayes seems skinnier than before. Hayes (flustered) What? What you talking about Willis. I ain’t no pile o bones. I is only 49. From out of another trailer comes the Dudley Boyz and Spike, Booker T and Sharmell and a Moondog nobody has ever heard of. You: Something about a pile of bones. Hey man, help me get this guy to the hospital, we found him by the creek next to the Maple Syrup shack. Booker: Hey Dawg. What’s all the ruckus. Paul E comes out of another trailer with Mitch the Tie Straightener guy. Mitch sees Hayes and gulps.